You do not want to miss the Stunning Executive Custom Built Ranch in Award Winning Cedar Springs School District! Home features a Custom Gourmet Kitchen with a large pantry and Quartz Counter Tops, Cathedral Ceilings, Main Floor Laundry Room, A stunning Music or office area, Hardwood Flooring, Huge Master Ensuite with a large walk in closet, 4 bedrooms 2 full bathrooms and 2 half bathrooms including a Jack and Jill bathroom, Solid hardwood doors, Also a separate office with its own private entrance. Solid Brass hardware throughout. This was a builders personal home, when it was built so attention to high end details is apparent throughout. The lower level features a huge Family area that would be great for entertaining A large mother in-law suite with an additional full bathroom. Walkout with a large patio area! Outside features 5.6 acres of pasture, electric fencing and 2 horse stalls, Outside spicket for easier watering, Also a large tackroom/ feed area! Walkout with a large patio area! 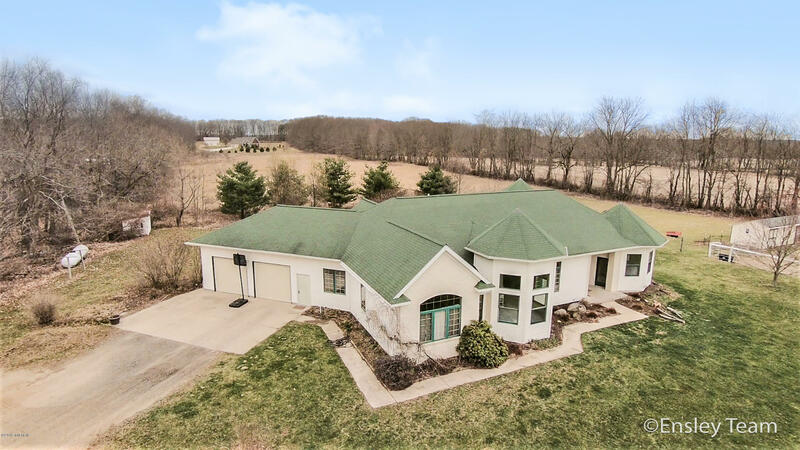 Outside features 5.6 acres of pasture, electric fencing and 2 horse stalls, Outside spicket for easier watering, Also a large tackroom/ feed area! Home is offered 2 different ways House with 12 acres or the house with 17 acres.